Scientists have identified for the first time the ‘cell of origin’ – in other words, the first cell from which the cancer grows – in basal cell carcinoma, the most common form of skin cancer, and followed the chain of events that lead to the growth of these invasive tumours. Our skin is kept healthy by a constant turnover, with dying skin cells being shed and replaced by new cells. The process is maintained by ‘progenitor’ cells – the progeny of stem cells – that divide and ‘differentiate’ into fully-functional skin cells to replenish dying skin. These cells are in turn supported by a smaller population of ‘stem cells’, which remain silent, ready to become active and repair skin when it becomes damaged. However, when this process goes awry, cancers can arise: damaged DNA or the activation of particular genes known as ‘oncogenes’ can trigger a cascade of activity that can lead ultimately to unchecked proliferation, the hallmark of a cancer. In some cases, these tumours may be benign, but in others, they can spread throughout the body – or ‘metastasise’ – where they can cause organ failure. Until now, there has been intense interest in the scientific field about which types of cell – stem cell, progenitor cell or both – can give rise to tumours, and how those cells become transformed in the process of tumour initiation and growth. 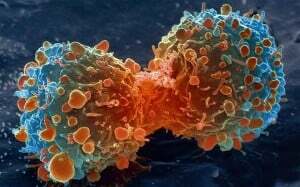 Now, in a study published in Nature, researchers led by Professor Cédric Blanpain at the Université Libre de Bruxelles, Belgium, and Professor Ben Simons at the University of Cambridge, have demonstrated in mice how skin stem and progenitor cells respond to the activation of an oncogene. Their studies have shown that, while progenitor cells can give rise to benign lesions, only stem cells have the capacity to develop into deadly invasive tumours. The researchers used a transgenic mouse model – a mouse whose genes had been altered to allow the activation of an oncogene in individual stem and progenitor cells. The oncogene was coupled with a fluorescent marker so that cells in which the oncogene was active could be easily identified, and as these cells proliferate, their ‘daughter’ cells could also be tracked. These related, fluorescent cells are known as ‘clones’. By analysing the number of fluorescently-labelled cells per clone using mathematical modelling, the team was able to show that only clones derived from mutant stem cells were able to overcome a mechanism known as ‘apoptosis’, or programmed cell death, and continue to divide and proliferate unchecked, developing into a form of skin cancer known as basal cell carcinoma. In contrast, the growth of clones derived from progenitor cells becomes checked by increasing levels of apoptosis, leading to the formation of benign lesions.